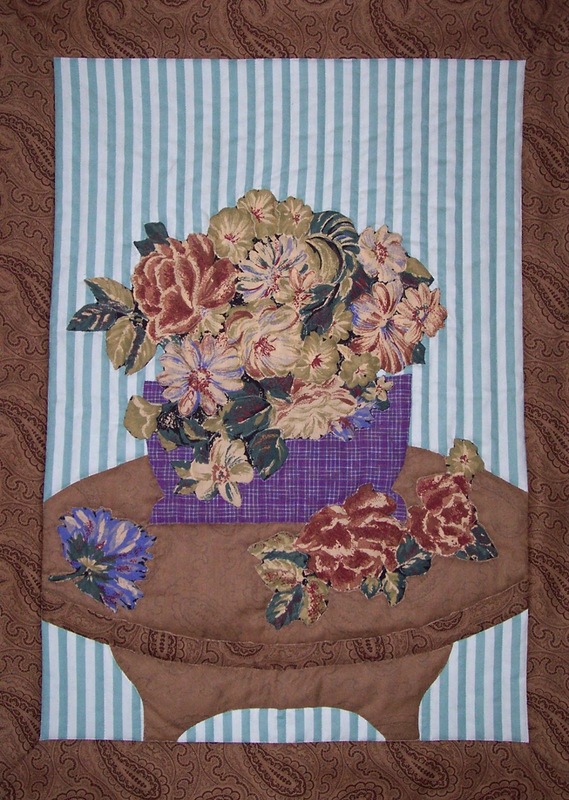 One of my favorite quilting activities is participating in challenges - this is one of first challenges that was put out by my quilt guild (Coos Sand 'N Sea Quilters)and was made in the summer of 1993. We were given a fat quarter of the floral fabric and a fat quarter of the brown paisley. We could add two more fabrics and make a quilt within a certain size requirement - I believe it was 100 inches perimeter. This is what I cane up with and I gave it the highly creative title of Flowers on Table. 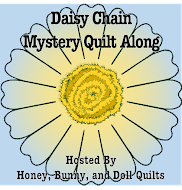 It's hard to make a quilt with only four fabrics, and to tell the truth I wasn't too inspired by that floral...I thought it quite dull and lacking in color. By using the back of the brown paisley I was able to give myself a little more variety to work with so I could make my table a little more interesting. The table was inspired by an antique we were given when we were just newlyweds working on a paper route in the early mornings. One day a sweet old couple asked us if we wanted this darling table and it's been a part of our household ever since! It used to have a glass top, but that disappeared somewhere in one of our moves. Since I wasn't very experienced with hand applique at this point, I simplified the base of the table! 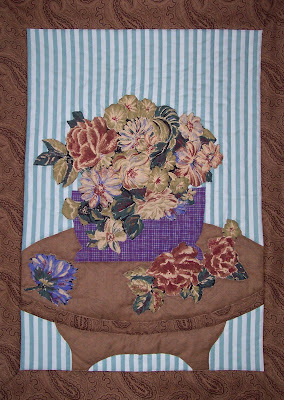 I drafted my own basket pattern and made the basket out of the purple fabric, then used the Borderie Perse technique and needle turn apppliqued the flowers to my quilt. I decided to finish the quilt without a binding after adding the mitered border and machine quilted around my appliques and echoing the lines of the stripe. This was probably my first effort at free motion quilting! And here is another picture of it - I just realized it's a bit dusty and I should take it down and shake it off! It's been hanging in a corner between two windows, and I'm glad to see that it hasn't faded significantly that I can tell. It's a nice little piece of art for my room, and it reminds me of how much I have learned in the past 24 years. I still enjoy working on challenges, though. You can learn so much by challenging yourself to work out of your comfort zone and have some fun, too. Are you challenging yourself to learn new skills or pushing yourself to explore different colors and fabrics? I hope so, whether in a group, or just on your own - it's good to leave your comfort zone and do something different. Who knows, you just might find a new niche for yourself!